This journey along the East Coast mainline starts from the spiritual home of the LNER (London North Eastern Railway) and continues south to their London terminus. Despite the lack of scenic interest on this route there is significant railway history to be enjoyed on the journey of just short of 156 miles. Taking less than 100 minutes I opted to use the 12.07 non-stop Grand Central service, which originated at Bradford Interchange, taking full benefit of the affordable first class fares available on some Saturday trains. 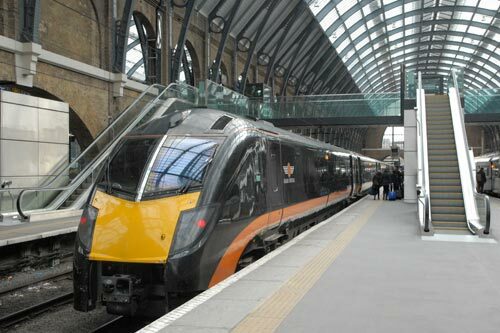 The East Coast mainline, which links London with Leeds, Newcastle and Edinburgh, saw electrification completed in 1990 with a maximum line speed of 140 mph (225 km/h) over some sections. Grand Central use 5-coach Adelante class 180 DMUs on the Bradford Kings Cross service and despite their troublesome history the journey was completed on time in comfort. Departing Doncaster the locomotive works on the west side of the station remains operational although is in many ways a shadow of its former self. This works was responsible for designing many of the steam locomotives that graced the route. As the train accelerates south you pass extensive marshalling yards probably containing a few coal and container trains that form the bulk of today's freight traffic. Retford is the first major station passed en-route and like many stations shows little evidence of its more glorious past from the days of steam. Not much later the train rattles through Newark-on-Trent crossing the meandering River Trent a minute or so before the station. Also of note is the flat crossing where the Nottingham to Lincoln railway crosses the East Coast mainline. This is one of the few flat crossings still in main line use. Grantham is passed at speed again showing little of its once important status in steam days. One of the highlights lies a few miles south of Grantham between Little Bytham and Essendine. It was here close to milepost 90 that Mallard broke the world speed record for steam locomotives at 125.88 mph (202.58 km/h) on 3 July 1938 using the slight downward grade of Stoke Bank to its advantage. Today a line-side sign marks the historic spot and can be seen on the left hand side. A signal check prior to Peterborough meant that we ambled through the station which is currently being rebuilt. The area around this city was once famous for brick making and some remnants of this important industry can still be seen. Today Peterborough is a commuter city with many using the train to work in London. Huntingdon, St. Neots, Sandy, Biggleswade, Hitchin and Stevenage flash by in quick succession as you enter the suburban sprawl that now makes up Greater London. Knebworth is followed by two tunnels (Welwyn North and South) followed by Welwyn North and Welwyn Garden City stations. By now countryside has all but disappeared. After Hatfield a section of the Great North Road appears on the left hand side. Potters Bar, site of a serious railway accident in 2002, is the next station of note after which the train threads another series of three tunnels as it dashes through suburbia. Alexandra Palace lies on a hill to the right where in 1936 it became the headquarters of the world's first regular public "high-definition" television service, operated by the BBC. Affectionately known as "Ally Pally" high profile events are still held in this venue. Passing Finsbury Park you get a good view to the left of the Emirates Stadium home of Premier League Arsenal Football Club. The train has slowed considerably and you are on the final approach to London Kings Cross burrowing underground. If you are lucky you may get a glimpse of a Eurostar train crossing above you on Britain's only high-speed railway. In 2013 Kings Cross station is a great place to arrive. With the overall roof cleaned and re-glazed as part of an extensive refurbishment programme it is now bright and airy. Before leaving the station it is worth visiting the new semi-circular station concourse which features some impressive exposed steelwork to the design of John McAslan.